In this original post from 2010, composed at the start of my interest in Thai cuisine, I eagerly penned this recipe. 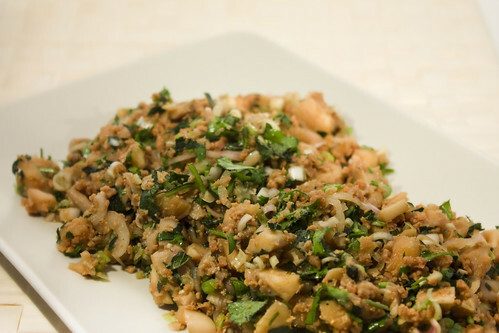 I have since furthered my education in Thai cuisine and have since added another vegan mushroom lap recipe to this site. The original recipe still works, and moreover is still tasty, but for the purposes of authenticity (as much as I dislike that word in food discussion) I posted the aforementioned new recipe that is more discriminating. It was the fall of 2003 when I first set foot in Southeast Asia, also the last time I’ve been inside Laos. Sitting outside a cafe along the main drag in Luang Prabang, my now chef-trained friend wanted to try a popular national beef salad: Lao Larb. So spicy it took her awhile to consume what she could, I’ve both taken my version down a notch in the chili department and veganised it to boot. A bit of chili is a must with this dish, but if you absolutely despise it then I get it. By all means ditch the ingredient. Otherwise find your space along the chili spectrum and add just enough to suit your tastes (start small, kids). In terms of other ingredients, my version is quite salty with a strong tang from the lime juice. You may want to cut back a little bit for a milder flavour, replacing what you leave out with water (so the TVP has something to soak up). You can always season with more of any of the liquid ingredients later. Heat the soy sauces, lime juice, water, and palm sugar in a small saucepan just until the sugar is dissolved. Remove from the heat and add the TVP and green chili. Most of the liquid will be soaked up. Toast your rice by simply dry frying it until it browns, followed by a quick session with a pestle and mortar (5 minutes-ish total time). In a large bowl, add the rice powder, mint, spring onion, shallot, lemongrass, lime leaves, and cashews (just deep fry cashews until they’re a couple shades darker). Heat another pan or wok and stir fry the mushrooms with a little oil, just until they begin to release their juices. Tip the TVP and any remaining sauce in and stir well, stir frying for another minute. Add the mushrooms and TVP to the bowl with the other ingredients and mix well. Serve with rice or fresh thinly cut vegetables and salad (or all of the above). You’ve made a very brown dish look very delicious. *you should have seen this before it hit Photoshop. This is a fantastic dish, I’m not vegetarian but love good food and this ticks all the flavour boxes. I also cut out the water and used more dark soy and less light to cut down on liquid. I’m trying to get a friend to do it but they don’t have a mortar & Pestle, any substitution suggestions for the rice flower? A great blog all round, and a lucky stumble/find for me while researching soy milk for a friend. I ate this almost daily while I visited Laos in 2007, better then the Thai version I must admit. What I loved most was that they served it with a basket of sticky rice. Afterwards I made it at home regularly, but haven’t had it for more than 8 years. Since I went vegan 4 years ago it was a no-go. But with this you inspired me to try it, of course accompanied with sticky rice! Thanks!